February 14th has once again rolled around and I have once again embarked on a quest to "make" chocolates for my charming husband. I haven't always been a fan of the day, and I wouldn't say I'm entirely on the bandwagon now. Still, I kind of enjoy it here in Japan. A significant part of that is, no doubt, because I'm not single. I also like that it's not entirely about romantic love alone, especially with tomo-choco - chocolate for friends - becoming such a thing. The major appeal, though, has to be the emphasis of chocolate. I love chocolate and Valentine's Day gives me an excuse to try out new varieties of it, including preparing my own. Sure, they're a gift for my husband, but I get to sample them. Thoroughly. To be really sure they're alright, you know? 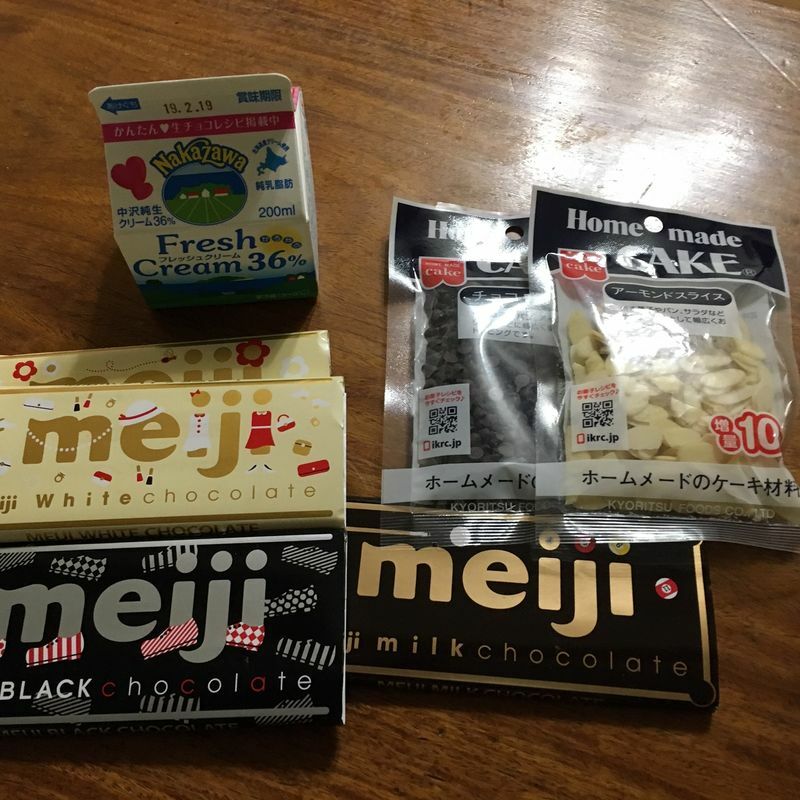 I have to admit that I've forgotten where I learned this technique for making honmei-choco, the more expensive and/or handmade chocolate that is given to males you love. I believe it was one of my English students, though, and I am very grateful to her! It results in delicious chocolates but it doesn't break the bank, it isn't overly difficult, and it doesn't take especially long. 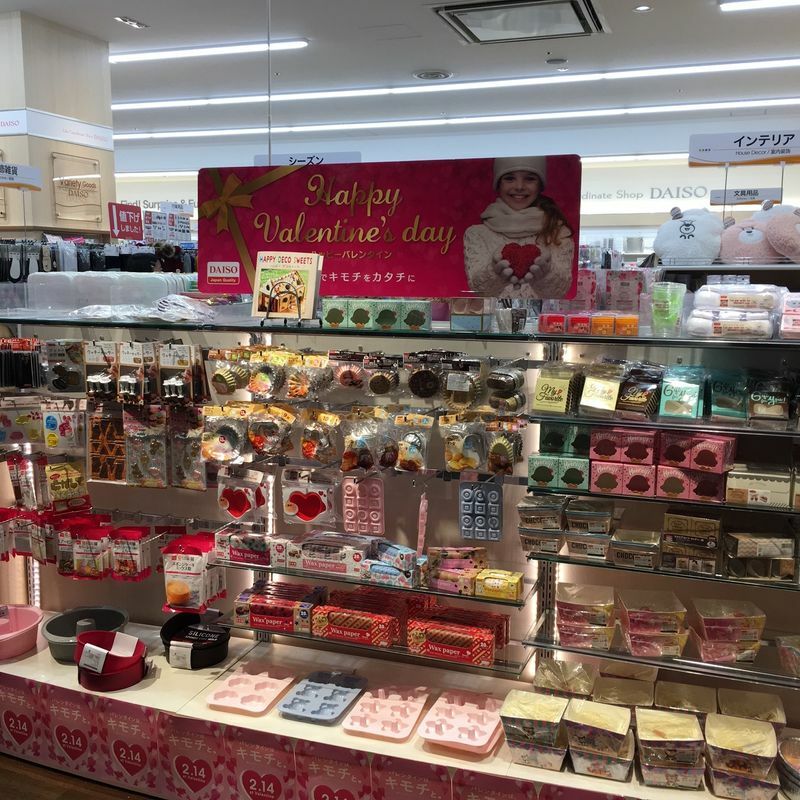 The chocolates and decorations are available all over the place in the lead-up to Valentine's Day, and they're still around ahead of White Day as well. You can get the cream at pretty much any supermarket, though I suggest buying it at least a couple of days in advance just in case there's high demand. I bought mine at Maruetsu. 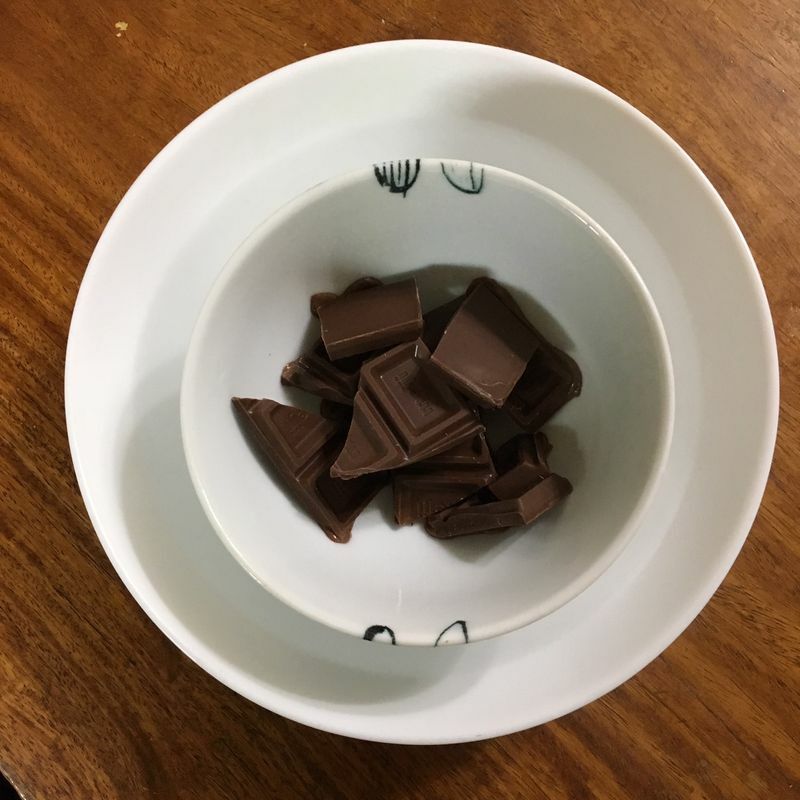 Break up all the chocolate bars into pieces and put them into smaller bowls. Put the smaller bowls into the larger bowls, and pour boiling water into the larger bowls so it's around the smaller bowl. This is to melt the chocolate. Wait, probably less than 15 minutes. You can cover the bowl to speed things along. If the chocolate still hasn’t melted, replace the water with more boiling water. Mix the melted chocolate and add in the cream. I used about 1 tablespoon for the milk chocolate, 1 tablespoon for the dark chocolate, and about 1/2 tablespoon for the white chocolate. Combine the different chocolate flavours in whatever way you wish. I strongly recommend the milk chocolate/dark chocolate combination; I only used white this year because it provides a nice contrast. Use the teaspoon to spoon the chocolate into the cups/molds. Put the molds into the fridge to cool. When the chocolate has just started to set, press the decorations onto the top of each one. You want the chocolate to still be malleable enough that the decorations set in, but not so fluid that they sink into chocolatey oblivion. Depending on the temperature of your room, you might be able to skip the previous step, decorate, and then cool the chocolates. Leave the chocolates to finish setting (at least one hour, more to be on the safe side). Extract from fridge shortly before gifting and arrange in the box! 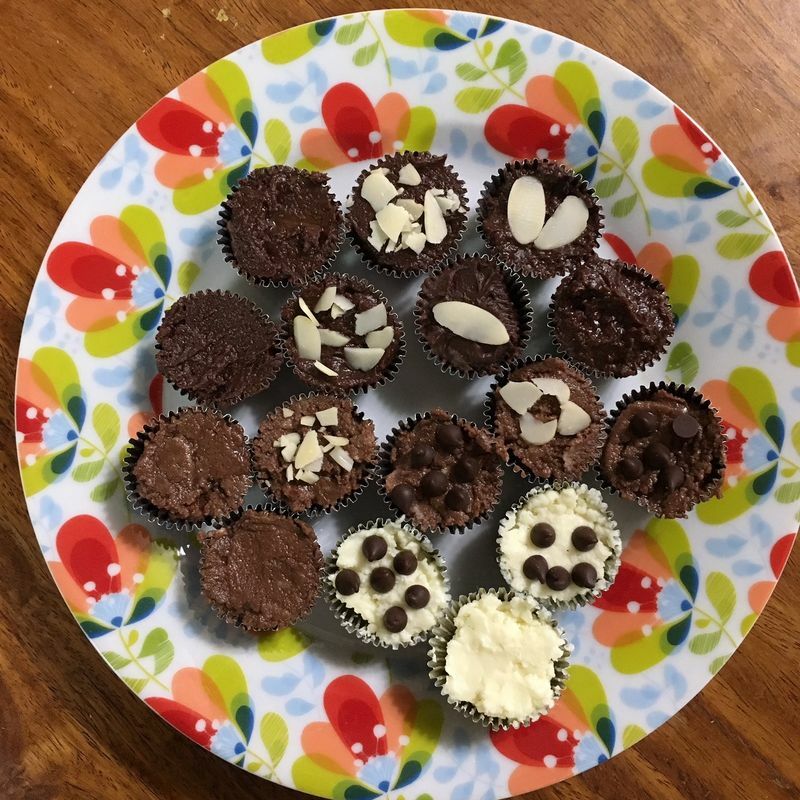 You'll need to work fairly quickly with this recipe - the chocolate sets fast. The February temperatures really don't help matters. Be prepared to keep boiling more water. In lieu of the above chocolate setting problem, you're not going to want to leave your dishes sitting around indefinitely after you're done. Wash up! Check that the size of the chocolates and the size of the box work alright together. 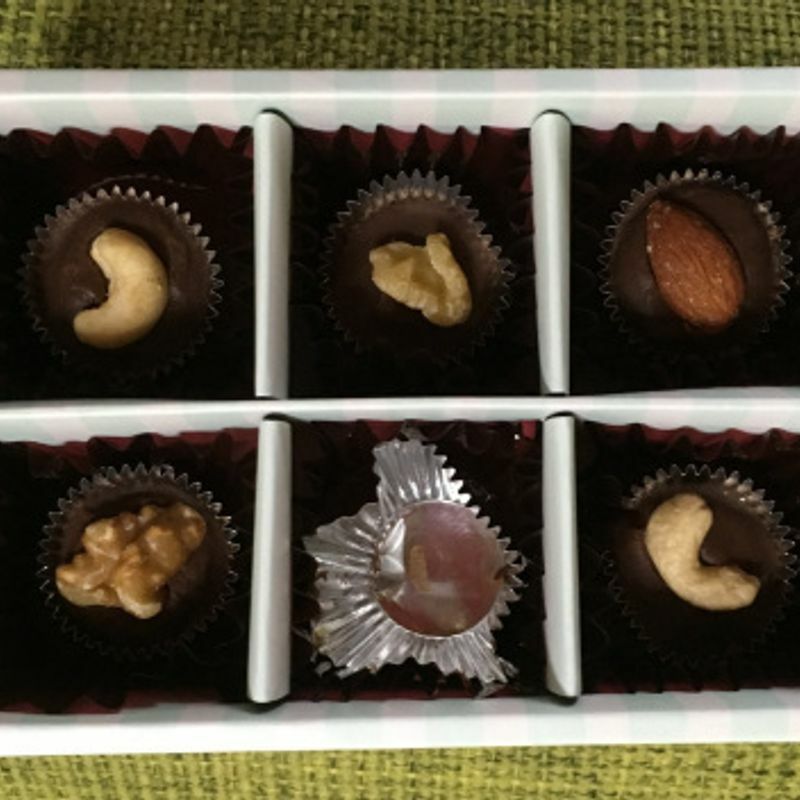 It might be a good idea to buy the tiny chocolate cups and the gift box from the same place just to make sure everything fits. And that is how I do Valentine's Day! It may not be how the master chefs do it, but it works for me. So far, my husband has thus far been very happy with the chocolates and if he suddenly becomes less than happy, I am more than willing to deal with the chocolates myself. @ReishiiTravels Aww, I don’t blame you. The sets are super cute!